Metropolis Magazine, long a proponent for green design, declares, "Despite claims to the contrary, products with zero environmental impact do not yet exist." With all the talk of green-ness going around, it's tough to think that a truly environmentally neutral product hasn't been created. That day may be coming, though. 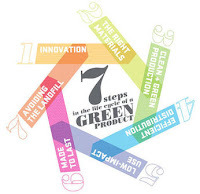 In "7 Steps in the Lifecycle of a Green Product", writer Martin C. Pedersen says, "new approaches to green design point to a day when that might just be possible."